If you look back into Tool-Rank history, you might notice that the Sanding Detailer looks like a mini version of the SandDevil, a product that I love. One end of the Sanding Detailer is tapered to fit into tight areas while the other end is rounded to better match contours. The tool is spring loaded to insure the belt is always held in place, but the belt can still be easily rotated so you can maximize belt usage. 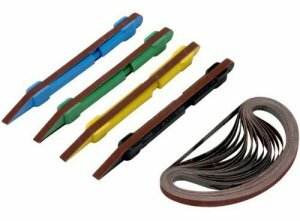 The Sanding Detailer comes in a 24-piece kit that included 4 color coded Standing Detailer Sticks, and a range of fine grit or coarse grit sanding belts. You can also find single sticks available in some stores.